CORCORAN FARM EQUIPMENT ABSOLUTE AUCTION AUCTION: Saturday November 2nd 2013 at 10 AM * 1960 Kellenberger Rd., Chillicothe, OH 45601 Preview on Friday, November 1st * 8 am to 5 pm INVENTORY FOR AUCTION TO BE USED ONLY AS A GUIDE As agents for Andrew Corcoran we are proud to be offering such fine, well kept and mostly shedded equipment and implements; he has ordered the following dispersal to be held on his farm on November 2nd 2013. 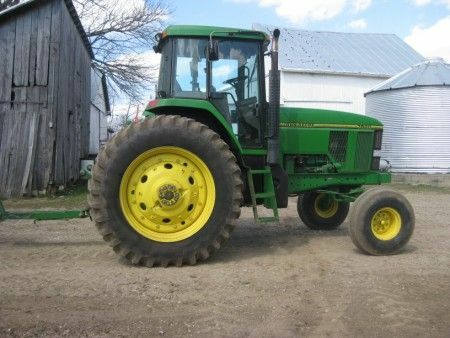 Tractor & Combine: John Deere 7800 - 1993 Model with apx. 5,666 hours showing; Serial #: RWSG050001269, with duals and weights, 18.4 R42. Combine: John Deere 9410 apx. 1998 model showing 1,483 engine hours/1,041 separator hours, ID #: H09410X675185. 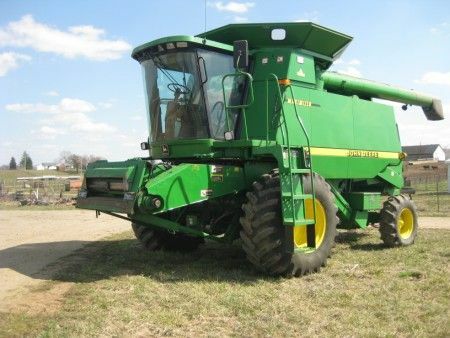 John Deere 922 F-2002 Grain Platform; John Deere 643 Corn Head apx. 1980 with rake option to lift down corn when needed. Grain Truck: F-600 Farm/Grain Truck apx. 16' bed Serial: F61EV080223, Showing 65,823 miles. Planting/Tillage Equipment: John Deere 7200 Corn Planter- 8-30" row planter apx. 1988 model, very clean; John Deere 750 Grain Drill 15 ft. with grass seed box and John Deere Markers apx. 1998; 3 point hitch Worksaver grass seeder; Case International Disc 496 Tandem Disc harrow with rake with like new blades apx. 1991; John Deere 1450 plow with 5-18" with rake; John Deere Chisel Plow mulch tiller & rake, 9 shank apx. 1989; John Deere #400 Rotary Hoe 8 row with transport 1979; International Subsoiler #10, 7 shank apx. 1983; Harrigator 1976. Hay Equipment/Wagons: New Holland 855 Round Baler Serial #: 8630022, 1991 with net wrap; John Deere 348 square baler (wire tie) Serial #: E00348X769205; New Holland Disc Bine 1432, 13', center pivot apx. 2007; (2) John Deere 670 Hay Rakes; Pivot Tongue Rake Hitch 1996; New Holland 6 basket #169 Hay Tedder Digidrive; Round Bale Mover 2 wheels- 11 bales; Round Bale Mover 4 wheels - 5 bales; Bale Mover 3 point hitch; Hay wagon New Holland apx 14'; New Holland apx. 16' with flat bed; Case apx. 16' hay wagon with flat bed; J&M apx. 18' hay wagon flat bed; Hay Conveyor apx. 47' with electric motor and dolly cart; Hay Conveyor 27'6" with electric motor; Hay conveyor apx. 23'9" with electric motor; Hay conveyor 18'10" with electric motor; J&M 350-2D gravity bed wagon 13 ton running gear 1983; J&M 385-5D gravity bed wagon 13 ton running gear with tarp; Killbros gravity bed wagon with apx. 16' auger with down spout #350-10 ton running gear; Killbros #350-10 gravity bed wagon with running gear; (2) Gravity bed wagons used for bulk feed no running gears 1-Killbros & 1-McCurdy Miscellaneous Equipment: 2012 Like New Westfield auger power take off, 80-61-8"; Shaver HD-10" Post Driver apx. 1933; Ford-Danhausser post hole digger apx. 1975; Howe #57 apx. 1000 lb sealer weigh buggy on wheels; Apx. 12' by 8' trailer 2 axel with wire sides and ramps; Trailer with 2 wheels Fence maintenance and construction trailer; Hydraulic Dump Bed, dual wheels 5' by 8' bed; pickup truck fuel tank with hand pump; Fuel tank on skid with electric pump apx. 300 gallon; Tractor Dual wheel & tire changer model 51. Livestock Equipment: John Deere Manure Spreader 450 push, w/ lift gate apx. 1990; Feed Bin apx. 4 ton w/ gate no top; Cattle Feeder 10' Smidley Steer Stuffer; (2) Smidley Steer Stuffer apx. 7'; (3) plastic feed bunks apx. 9' 6"; (8) apx. 8' concrete feed bunks total of 64'; (10) 8' concrete feed bunks total of 80'; Patz #150 Drag feeder apx. 2 yrs old chain apx. 77'; Patz H 98-B unloader 18' with 7.5 hp motor; Elevator from silo to drag with motor apx. 20'; Bulk Bin 4 ton w/ auger (no motor); Yetter Grain Cleaner with auger & 2 motors; grain bin fan 27" 10 hp; telephone poles/guard rail; silo unloader. Personal Property Terms: Paid in full with Cash/Check day of the sale with postive photo ID, sold in As-Is condition no warranties given, expressed or impled. For specific information feel free to call Mr. Andrew Corcoran at 740.642.2375.